Today I am on another road trip with husband Greg – who has many occasions to do funerals and weddings out of our immediate area. It is a rainy dark day with many clouds looming above that look heavy with water. The further north we drove the darker those clouds became. I have these great sunglasses that have a amber type glow to them. When wearing them I notice how bright everything becomes – without the glare. Today as we rode into ever increasing darkness – I finally had to take them off. There was no brightening up that darkness – not even with amber glow glasses. 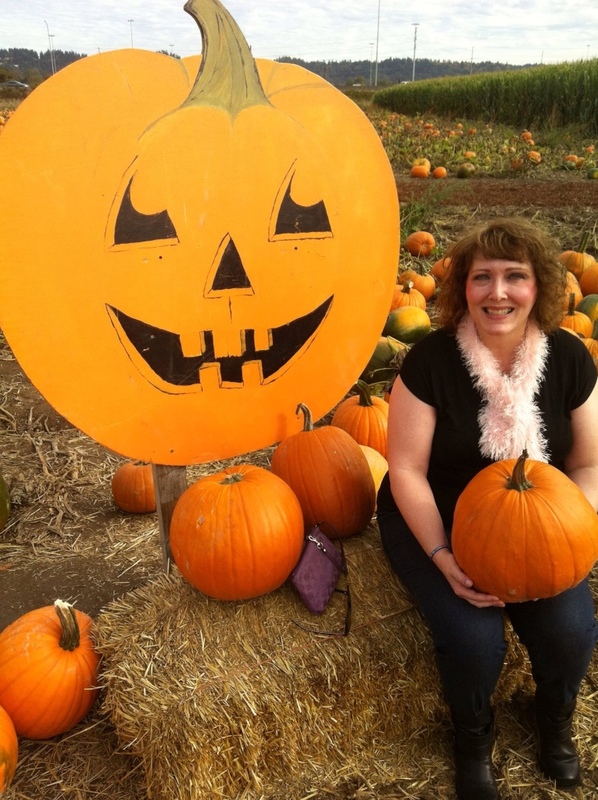 I am thankful for my sight – even though at times I complain about things being too bright – like yesterday when we went to a nearby pumpkin patch to pick out a special pumpkin for carving. I wanted a picture – but the glare was unbelievable. However, undaunted – I posed for the camera anyway. What's a little glare, right? I'm also surrounded today by a bunch of NOISE. It is a crowded Starbucks with many conversations and LOUD music streaming through the place. Not that anyone is listening to it. I close my eyes and try to imagine what it would be like to be blind. To have to depend on just my heightened sense of hearing to take in everything happening around me. It is confusing – not sure how I would process all this noise without seeing. The other day we watched the original “The Miracle Worker” with Anne Bancroft playing Anne Sullivan and Patty Duke playing Helen Keller. It had been many years since I had seen this great movie and was just as fascinated with it when watching it again. Can you imagine a world with BOTH sight and hearing gone? This seem inconceivable and very rarely do we hear about a person today with limitations in both areas at once. When I try to imagine what it must have been like for the very brilliant mind of Helen Keller to be in a world of darkness and silence – forever – it is difficult. When is my world ever completely quiet? I always have some music playing when working at my desk – can hear my husband upstairs coughing or sneezing – hear the neighbors with their dogs – or when they are working in the yard. I hear cars and trucks going by our house and a million other sounds that I am just used to. When I try to imagine a world of darkness I think about this when it is night time and I am going to bed. I lie very still in my bed and as quiet as I can and try to stay there and not move. This was the world of Helen Keller. What must it have been like? Helen was not born blind and deaf so the chances that she had some memory of seeing and hearing are very probable. She would have wondered what happened to her I'm sure. But mostly she had to learn how to communicate with Anne Sullivan who came to work with her and would not give up until she found a way to make Helen understand that letters formed words and words belonged to things she could smell and touch. When this was learned (I have NO IDEA how that could possibly have happened – except that Helen Keller was brilliant) it was no problem for her to learn – and learn and communicate she did! She graduated college and traveled the world – even learned to speak – truly amazing. We truly have no excuses – those of us that have sight and hearing at our disposal. Sometimes I wonder if our senses actually handicap us out of doing remarkable things – like Helen. It is so distracting to have sounds and sights in our everyday world. We get used to the distractions and it numbs us to producing things that limited people seem to have no trouble achieving. Is it because they are silent and have that inward focus that we lack? I know I would not have the personal modivation to live in silence and darkness. That is something learned and practiced. A person with limitations either in sight or in hearing has learned valuable things in the darkness and silence that the rest of us will never learn. Can you imagine a world without music? Without mountains you could see? Never see the face of the one you love? Never hear their voice? Dear Lord – help me be truly appreciative of your many blessings today. Amen. 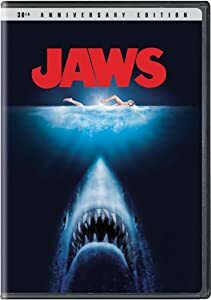 Last night Greg and I watched a 2 hour documentary about the making of the movie ‘Jaws’ – released in 1975. I remember going to see ‘Jaws’ that summer with some friends – in fact I’ll never forget it. It reinforced my very strong fear of the water and especially the ocean. What looks easy to the observer, however, often is just the opposite. This movie was fraught with disasters, cast and crew problems and weather complications filming on the open sea. 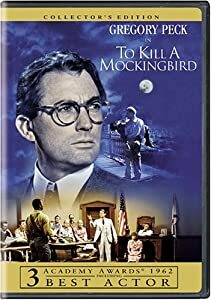 As I watched all of this – my appreciation for a great film increased as was my admiration for the film’s young director, Steven Spielberg who was just 27 years old at the time. Spielberg, in a very candid interview about his memories of making this film said this, “Everyday I was worried I would get fired – I thought it would finish me as a director – but I keep pushing on anyway” And push on he did – way over budget and past the breaking point for cast and crew many times. He worked well under the stress – even Richard Dreyfess said, “All Steven did was bite his nails” Well you know the rest – ‘Jaws’ brought many records that year and was the first of what we would call ‘blockbuster’ films of that era. What could have been Spielberg’s worst disaster – turned out to be his greatest achievement and his shining moment. All because he did not give up and give in to the negative – worked with integrity and finished it. A true masterpiece. How many times have I been through a ‘Jaws’ season? Too many. But I have also learned something. Even in my darkest times as a human being – my true self comes out in a way in which I cannot hide. It is my true nature – my default setting. And often times what feels like my most disastrous season – may also be my finest moment. Every ‘saint’ of the Bible went through their own ‘Jaws’ period at one time or another. What separated them from other people – was that they were people of faith and they trusted God – kept their heart right – and didn’t compromise who they were even when hit with hard times. They kept believing – kept hoping and kept loving. Have you ever had a ‘Jaws’ season? A time when trouble came to you – hung on and wouldn’t let go? An illness or family problem that you just couldn’t brush aside – but that went on and on – forever? A stress or heartbreak that threatens to swallow you? Hang on. Don’t lose hope. Help is on the way. And though you cannot see it – there is a reason. And someday you will have the answers to the questions. The real you is being formed and shaped. There is a purpose for the pain. Here is a song by Amy Grant that has always helped me when I’m hit with a difficult season.